Joyful smiling mother holding her adorable preschool daughter with down syndrome relaxing in the kitchen dancing. Positive mom with special needs child enjoying leisure in rhythm of dance indoors. Portrait of loving mother and cute little daughter with down syndrome decorating homemade cookies with icing. 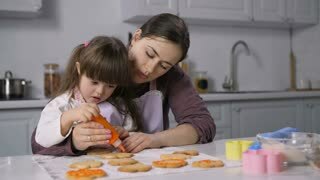 Positive special needs child helping mom to decor freshly baked biscuits in kitchen. Cheerful adorable little daughter with special needs kneading dough with rolling pin in the kitchen while learning cooking with mom's assistance. Positive girl with down syndrome preparing cookies. Portrait of positive little daughter with down syndrome and loving mother preparing healhty food in domestic kitchen. Cheerfuf preschooler girl with special needs helping joyful mom cooking indoors. 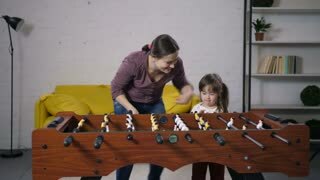 Joyful happy mother and her excited laughing daughter with down syndrome playing table soccer in domestic room. Positive family with special needs child enjoying leisure playing football table soccer. 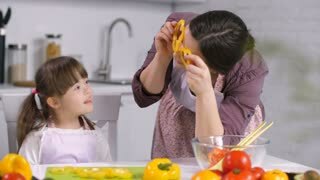 Positive carefree mother and her joyful smiling little daughter with down syndrome having fun while preparing food together. Loving mom playing with her special needs girl in kitchen during cooking. 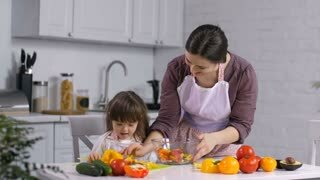 Loving caring beautiful mother and cute little daughter with special needs communicating and learning body language while spending leisure in the kitchen while baking delicious cookeis. Caring mother developing motor skills of cute daughter with down syndrome while cooking together in domestic kitchen. Engrossed little girl with special needs cutting cucumber with help of her mom.